Recently an article about how ballet has helped a young woman, Min, heal from her eating disorder, “Reverse Black Swan Syndrome,” has caught my attention. What she experienced goes against what is more commonly seen in the ballet world, where the pressure to perform and to achieve a perfectly slim body sometimes leads to, instead of heal, eating disorder. Min is a Singaporean Chinese who went to study law in an Australian university but found the pressure to achieve to be a bit too much to manage. As a result, she fell into anorexic behavior. It is really interesting to read the journey she went through and how she found cure in ballet class and even became the owner of a successful ballet-inspired ethical clothing brand, Cloud & Victory, after she graduated. In some ways, her story reminds me of my years in a U.S. college where I started to binge eat due to the pressure to achieve and to get my English standard on par with native-English speakers. How would it be possible for a foreigner like me to be admitted to journalism school, when I didn’t even know what was funny when my fellow classmates cracked a joke, or when I made a silly mistake as my school-taught British English turned into something hilarious in the American context? There were so many books to read, such long papers to write, and so many new cultural impressions and shocks. I didn’t know I had any sort of eating disorder, despite boxes after boxes of chocolate chip cookies and cans after cans of soda pops that accompanied me through those all-nighters. Come to think of it, ever since I was a kid, I had used snacking to deal with the pressure of studying. It was as if eating could help me to fill a gap in my soul, to fight the loneliness in the struggle to be the best in my environment. It helped me pass the long, long hours buried in the books. But it did not help raise my self-esteem, despite the good grades I eventually got. I never went as far as becoming bulimic though. Sometimes I would have a tendency to watch everything I ate—such as during my last two years in high school when I tried to lose weight. It was hard on my body and my effort was totally wasted as soon as I entered college. In the first six months, I gained 20 pounds! My parents couldn’t even recognize me when I went home to visit during Christmas holiday. Back and forth, back and forth… throughout my whole life I have struggled with my weight. It was actually my self-esteem that I struggled with. Despite the extrinsic achievements in my academic life—being always able to overcome difficulties and challenges to get to the top echelon—there was this insecurity about my self that had bugged me throughout my youth. I believe that this has to do with the mixed signals I received from my mother when I was a child. Whenever I got a good grade or an award, she would be really proud. Yet at the same time she always “bragged” to her friends in a false sense of humility that it was “nothing,” that I was “not good enough,” and she would make sure that I stayed humble and tried to do better the next time. So I guess I always felt that nothing I ever did was good enough. This feeling had lasted until quite recently, as even throughout my adult life, she has inadvertently transmitted the message that no matter how much and how well I do, it’s never going to be enough (Sounds familiar? Joy Luck Club, anyone?) I am glad that I have finally gotten over this feeling now. I finally understand, that it’s not about what I do, but who I am—and I don’t need her approval to be the unique person that I am. It is alright even if she does not understand. In addition to my weight swings, I have also been experiencing bouts of deep depression multiple times in my life. The first time around, my parents dismissed it as a something that couldn’t possible happen to me since I did not have a good enough reason to get depressed. Huh? That did not help very much! Reading Min’s story made me envy her for having such supportive and understanding parents. They did not question her through her darkest days; instead, they just gave her unconditional support. I think that is so crucial in her healing process, as they provided her with a safe emotional environment to refocus her energy on creating a company based on her new-found passion, a passion that stemmed from what healed her—ballet. As for me, ballet has healed me and hurt me in a million ways. When I have totally recovered from my surgery, I will ease into class and make sure I turn ballet into a source of joy and not a source of grief and tension. I will free myself from the harsh judgments of the mirror, from the silent comparison with my fellow beautiful and skinny adult students, from the strict demands for a “perfect ballet body,” and just allow myself to enjoy the pure essence of dancing! Me when I first started learning ballet (left) and two years later, at my slimmest, weighting less than 100lbs (right). Now I have gained back what I lost but feel stronger and healthier. 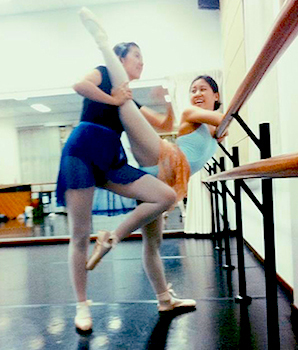 As I mentioned in my previous article, “Diary of an Adult Ballet Student,” more and more adults all over the world are taking ballet lessons nowadays. What’s attracting them to the dance studio? Apparently, ballet brings with it tremendous benefits in terms of health and emotional well-being. Another benefit of ballet is that it does wonders to your posture. As the basic requirement of ballet is to have a neutral stance with the spine straightened and hips “squared” (meaning, parallel on both sides), this posture is going to have a “spill-over” effect on your day-to-day posture. If you work on it consistently, you will end up looking as graceful as Audrey Hepburn! No kidding. Hepburn had many years’ training in a professional ballet conservatory, and this training showed in the way she carried herself on stage and behind the camera. Besides the beautiful look, a good posture is extremely important in staying healthy. Many pain syndromes that people living a sedentary lifestyle experience are a result of poor posture and muscular-skeletal dysfunction. So if you don’t have a good posture to start off with, ballet is going to magnify the problem – which is great, because you will now want to work on it and along brings the great health benefits of a correct posture. I will write more about ballet stance and healthy posture later. Speaking of sedentary lifestyle, ballet is a wonderful activity to get you off your chair. While many people choose yoga or Pilates these days to balance off the long hours of sitting and the lack of movement, some choose ballet for its high “fun factor”. In ballet we get to move along with music and make beautiful patterns with our bodies. We use a lot of “brain power” to remember the steps and to coordinate the different body parts. For example, we exercise the left brain for getting the “mathematical” parts – the logic of the step combinations – right; the right brain for interpreting the music and expressing our body in an artistic manner; the upper rear portion of the brain for interpreting spatial relationships; and the lower part of the brain for memorizing the steps. Since we do not use words to express ourselves in this art form, the part of ourselves that cannot be expressed verbally now gets a channel to come out. And the part that deals with language gets a welcoming “time off.” For me, this is a wonderful form of relaxation. No need to find the right words when I dance. It’s just direct, intuitive expression. Ballet is inherently a performing art. However, for most adult learners, performing for an audience may not be a possibility at all. Whether you end up on the stage or not, the ballet classes do provide a chance for you to “perform,” even if it is only for the teacher, your classmates and yourself. You will gain a sense of confidence in your own ability to execute movements along with music. If you are a shy person, you might even overcome your lifelong shyness! And if you are lucky enough to go on the stage, the applause and recognition you’ll get from the audience is worth gold. If you are sold on joining an adult ballet class by now, I can guarantee that you will be reaping a combination of the above benefits, even if you simply start off with the intent of keeping fit or shedding a few pounds. And along the way, you will also get to make friends in a niche field – friends who are as misunderstood by their familiar circle and as obsessed as you are with this art form.